If there is one player almost every fan to a man woman and child loves at Ibrox, it’s Jordan Rossiter. The infectious scouser has embraced everything about Rangers, and one foolish post on social media aside, carried himself with dignity, charm, humility and a hugely infectious disposition. He’s not had it easy, Rossiter – constant injuries have lost him 24 months of his career, but after most fans, ourselves included, gave up on him, he stormed back unexpectedly to give a stellar display at Easter Road in the infamous 5-5. His energy, vigour, pace, strength and sportsmanship were admirable, and on that brief 70 minute cameo, Rangers already looked like they had a capable starter next season. 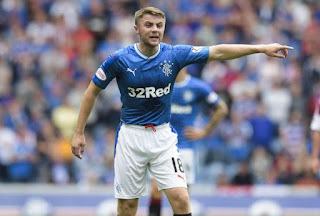 Rossiter is a talent, a talent who Rangers got, thanks to cross-border rules ordained by FIFA for youth players, at an absolute song compared to his legitimate value. If Jack Grealish is worth £40M playing for an Aston Villa side who didn’t even get promoted, the one year junior Rossiter’s £250,000 transfer fee looks beyond ludicrous. Some have even mentioned him for captain – he knows what it takes at a club the size of Rangers, and indeed Liverpool, and his mental strength to come back from the injury disasters he’s had while still showing the same enthusiasm he always had is something captains and leaders need. We wouldn’t necessarily subscribe to Rossiter as captain, but this brilliant young English midfielder’s market value, playing regularly and realising his potential, could and should be anything beyond £5M. And that is the kind of quality Rangers’ midfield is crying out for. If one player is going to absolutely benefit from Steven Gerrard as manager, it’s his protégé and the kid who idolises him – even then, Rossiter kept his feet on the ground when asked if it was extra special to have Stevie Ger as boss, and stated he was just delighted to be fit and hopefully part of the plans whoever took over. Jordan Rossiter could finally become the player he’s threatened to be next season, and it really is like a new top class signing for Rangers. This is the sort of player we can build around. Jack Grealish playing for a side who didn't get promoted... yet Rossiter made 2 appearances for a side that finished 3rd. Captain? Walk before you run Ibrox Noise! We can't be putting all our eggs in one basket with this Kid.. on paper it's all well and fine saying this and that but he needs to be fit for more than 10 games before I will even judge him. A bit like a Jack Wilshere. Great talent hindered by injuries. Personally would have McCrorie over him all day in that midfield spot and as a future captain in 5 years who is ONE OF OUR OWN. 250K fee sounds great but he got a £2 million contract for his 4 years you seem to forget the wages and value for money so far I'm not tending to agree with your statement about how he's a bargain as you're alluding too. 2 years in to the 4 it's this season or never for me. Coco, we can’t help but feel you selectively read parts of this and/misunderstood what you did take in. Everybody I know and discuss this POTENTIAL prospect feel desperate that a clearly frustrated young boy, gets stronger and the correct guidance on his areas weakest and susceptible to injuries. He certainly, to me, has a better than average ability for playing a defence splitting pass plus a thing missing DEFINITELY in front of goal in the last 5 years aside from Kenny Miller. COMPOSURE. I'd love to think the worst is behind the Lad. But building around him and relying on him being a mainstay in the team? No, that's like saying we can bring back Wallace as the main man at LB . again Waldo WAS magnificence personified and looked a world beaters THREE YEARS AGO. Then after he got caught out time and again as a poor defender it was clear he's not good enough. So yes, we need Rossitter back injury free and he will be an invaluable squad member. Again, already tried and tested and reliable is McCrorrie. Future Captain between the two? Not for me when Jamie Murphy is around. While we're discussing current cover etc. WHO is going to be back up for Shaffer? With Alnwick away, can anyone see Foderingham sticking around on the bench? Remember Theo Snelders and Boni Ginzburg? I tend to agree. A whole article based on one game. Long way to go before you can talk about him in that way I think. Still potential is there. David, it clearly isn't based on one game. And we are also discussing the potential, which ironically you agree with! Quite honestly we're not entirely clear on what Coco (or Brian for that matter) is actually reading because it's not quite what we've written. The laddie Rossiter has game. Has all the attributes and if he can keep fit and injury free he could be fantastic in the main area of the pitch that’s been letting us down. If Stevie G ever does get the Liverpool job, that laddie could be there with him. I would love to see this lad injury free and a run in the team! And with Gerrard here, his morale and spirits must be up 100 fold. Bring it on son!! I always said, when he is fit, he'll have to impress and when he came out against Hibs, that's exactly what he did. Showed what he's capable of, for me. I think he's a talent, if he can stay fit. He's not like Windass, all flash and no coconut. He delivers and he is an asset to us. ...But SG wouldnt do that because we got Rossiter from Liverpool! The only questionable point in this excellent article, and subsequent comments, is use of the word ' potential ', for my mind overused in football vocabulary. The dictionary defines it as " latent, that may or might but but does not now exist or act ". It evokes an air of optimism, generally speaking, and there is nothing wrong with that level of thinking, obviously. In the mindset of a young player, though, it could present problems ( I am thinking John Fleck }. Rossiter, it would appear, does not exhibit any such symptoms. Indeed, he seems entirely focused on furthering his career at Ibrox. Of course, each and everyone of us is eager to see how the team sheet turns out. This is one player who has a better than even chance of starting this season, and I,for one, am excited at the prospect of seeing him in the famous jersey. Ibrox Noise while I acknowledge some great points in the article and many of your other ones, I like to dissect your points and put up for debate with other readers the ones I don't agree with. Putting all the weight of the world on this boys shoulders when he's barely kicked a ball. You say he's like a new signing this Summer but I recall the exact same thing being said last Summer as well! It definitely has readers split as you can see by the comments we don't all agree but some certainly do agree with you which probably shows you the affection we have for this player because universally we all want to see the wee man flourish and get over the horrendous injuries he keeps getting. I do hope you guys are right as much as everyone else. He was touted for 8 million as a development fee when Stoke wanted him and we made a fantastic bit of business on PAPER but so far it's cost 1.25 million in fees and wages for a boy to have played no more than 400 minutes with 2 games last season and 4 before that. So saying he's a bargain thus far I still totally disagree. While I acknowledge he could be a 5 million pound player and Captain and Hall Of Famer etc etc, even if he keeps fit for 30 games a season, putting that pressure on him when he's been no where near the pitch is unfair pressure when he has a lot to work on. As I say, let him walk before he runs. I don't want this boy given any more pressure than he already has and like someone pointed out lessons need to be learned, we don't want another John Fleck who's now only finding his feet 10 years later at Sheffield United. Let's hope he cracks on next season.